SURVEY TYPES : Building Location / S.R.P.R. This type of survey is now commonly known as a Surveyor’s Real Property Report (S.R.P.R). 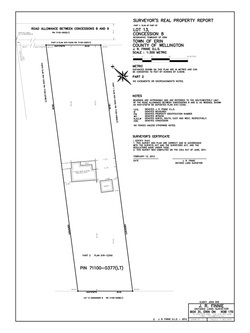 This survey shows all permanent man made structures on the property and clearly locates any registered easements, encumbrances or areas of interest/concern. This is an accurate 2 dimensional representation of a property, it shows legal boundary features and physical locations of structures. Real Estate: Detailed representation of property and features to be bought or sold. Lender: Protect interests by making sure legal description is correct and house is located on correct parcel.